You'll be £19.99 closer to your next £10.00 credit when you purchase Bloodline. What's this? Using easy-to-follow, family-tree type tables, Bloodline shows the origins and development of every regular formation in the British Army including the latest amalgamations and changes brought about within the ‘Future Army Structure’. The charts illustrate clearly how, in some cases, up to 25 original regiments of the line have, over the centuries, by successive disbandments and amalgamations, been reduced to a single regiment in today’s superb but shamefully overstretched army. The Battle Honours of each post-Cardwell constituent are recorded separately so the progress of each of the original regiments, and the theatres in which it was involved, may be examined individually. The pedigrees and Honours of disbanded units are also recorded so their contribution will not be lost to posterity. A chronological summary of Battle honours provides an overview of the British Army’s campaigns over the past 300 years and notes on the origins of each formation place its original purpose within the political and historical perspective of the time. A robust editorial platform throughout applauds the Army as ‘the Nation’s most dependable and trustworthy institution’ and castigates government neglect and public indifference for the unnecessary ‘blood and sacrifices’ which successive generations of soldiers have had to make as a result of inadequate investment and preparation. 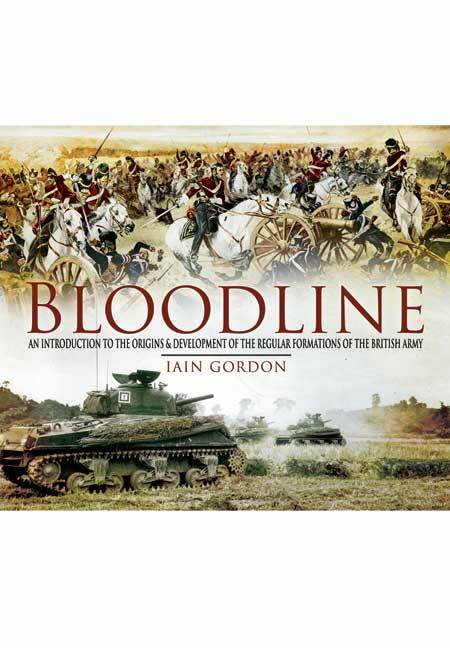 Bloodline is a splendid record of achievement and will provide an invaluable work of reference for anyone who has dealings with, or simply an interest in or affection for, the British Army. Iain Gordon was the founder of Method Publishing Co Ltd, publishers to the Ministry of Defence and Army Garrisons and Establishments throughout the world for more than 40 years. Since his retirement in 1995 he has written two highly-acclaimed military/naval biographies both published by Pen and Sword. His last book Admiral of the Blue: The Life and Times of Admiral John Child Purvis1747 – 1825 was shortlisted for The Mountbatten Maritime Prize in 2006. I know of no other resource that contains such a wealth of information about the History of the Regiments of the British Army. This will be a very useful addition to my shelf of military reference books. This is an invaluable concise work on the origins and evolution of the British Army's regiments and corps. This excellent text considers the lineage of the Regular Army formations of the British Army. It has been a major research project and the author has produced an outstanding guide of the “hereditary” of Regular Army units. However, it does not consider the extensive legions of the Yeomanry, Volunteers and Militia, or the splendid Territorial Army which would be massive undertakings in their own right. Given the scope of the project (as outlined above) Mr Gordon has produced a wonderful volume that significantly aids research into the principal regiments and formations. It confines itself to the significant changes in each Regiment’s development and does not attempt to record all of the frequent changes in titles. In the early days of the British Army regiments were called after their Colonel’s name. This meant that the regiments changed their names so frequently it was hard, and it still is difficult, to list all these changes. As the Army developed this trend ceased and regiments no longer bore their Colonel’s name. The author has placed great diligence in producing this book. It starts with an introduction to the background of the formation of regiments and he has included a “Precedence and Evolution” table listing the 1751, 1861 and 1881 (Post-Childers’ Reforms) of the regiments. This data is presented in a way that is easy to follow and aids research. Often it is necessary when researching regiments to know the current and previous names of the regiments. Without a table like this would you know that the “10th Regiment of Foot” in 1751 became the “Lincolnshire Regiment” in 1881 and eventually became part of the “Royal Anglian Regiment” in 2008? Not only does the outstanding usefulness of this publication rest there but there are superb notes on the history of individual battalions (within regiments), their lineage, any appropriate marches, the regimental museum, battle honours, their Home Headquarters and any affiliated formations. To name but a few features. The “write-ups” on the formations are categorised by their modern day “parents”. The Royal Horse Artillery, the Cavalry (Household, Heavy and Light), the Guards Division, Infantry of the Line (Scottish, Queen’s, King’s, Irish and the Prince of Wales Divisions), Gurkhas, Special Forces and the supporting units (Logistics, Medical, Engineers, Personnel etc) form the structure for listing the regimental details. Some formations do not have modern day counterparts and these discontinued units are also listed. If you conduct research into the main elements of the British Army then this is an invaluable guide as to their lineage, hereditary and modern counterparts. The author has produced an outstanding reference text in one easy to follow volume. He has done great service to aiding researchers with this publication. In one excellent volume he has listed the principal elements of the Army and their histories. This concise volume deserves space on any serious researcher’s shelf.